Filmmaker Jean Vigo had the kind of brief but brilliant career that die hard cineastes celebrate. His father was a militant anarchist who died in prison because he refused to fight in World War I. His death haunted Vigo as did the sickly health he experienced in his youth but it was during this time that he developed a love affair with cinema. His father-in-law paid for his first camera, which Vigo used on his first film, A propos de Nice (1930), a mock travelogue that blends staged scenes with documentary footage. The music that accompanies the images often mimics the pace of the film and, in its own way, provides a commentary on what we are watching. There is also a slice-of-life quality to the footage of the daily life for people in the city of Nice, France, which Vigo juxtaposes with stunning shots of a palm tree, a boat’s sail, and ocean water receding. Taris (1931) is a brief portrait of French swimming champion Jean Taris. The jaunty theme music sets an upbeat mood from the get-go. Naturally, we see the man in action and marvel at what a masterful swimmer he was. Vigo juxtaposes this footage with that of less than graceful swimmers frolicking in a pool. Taris demonstrates the right technique to become a competitive swimmer. Still, for such a traditional subject matter, Vigo’s handling of it is anything but as he artfully employs slow motion while alternating sound above water and silence while underwater. 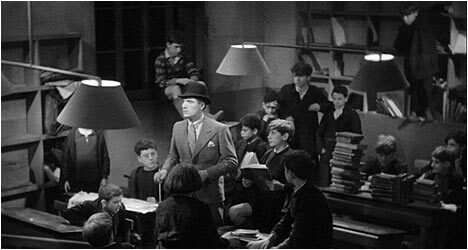 Vigo shifted gears with Zero de conduite (1933), a fictional short film about a boy rebelling from a boarding school. Clearly drawing on his own experiences as a child, the filmmaker sympathizes with the boys while satirizing the authority figures, one of whom he refers to as “tightass.” We see several of the students goofing off while the teachers are portrayed as strict disciplinarians with the exception of one who imitates Charlie Chaplin therefore making him the lone teacher sympathetic towards his students. The students represent the exuberance of youth, energy and vitality and it’s hard not to get caught up in their story. L’Atalante (1934) was Vigo’s most accomplished and last film. He was quite ill during its making as he suffered from tuberculosis for most of his life. This feature-length film focuses on a newlywed couple. Right after the ceremony, they embark on a barge and soon experience marital strife. This film shows Vigo maturing as an artist and makes one wonder how he would have evolved as a filmmaker. Sadly, his life was cut short at only 29, just a few weeks after L’Atalante was released. However, Vigo’s legacy is impressive with filmmakers like Francois Truffaut and Lindsay Anderson drawing inspiration from him in their own work. Most significantly, when Sidney Lumet won his honorary Academy Award in 2007, he name-checked Vigo in his acceptance speech. The first disc includes audio commentaries on all of the works by Michael Temple, author of Jean Vigo. On A propos de Nice, he gives a brief biographical sketch on Vigo and examines his legacy and impact on French cinema, including the French New Wave. Temple explores the genesis and making of the film in a way that is not dry but quite interesting. There is also an alternate edit of the film that is slight longer. On Taris, Temple looks at it in relation to A propos de Nice. On this film, Vigo was commissioned and used it to learn about and play around with film techniques. On Zero de conduite, Temple claims that this is Vigo’s signature film. He examines the autobiographical elements – his feeling towards his father and his anarchist beliefs. Temple touches upon why the film was banned in France by the government because of content and its attitude towards authority. Finally, on L’Atalante, Temple examines the tragedy that surrounded it – i.e. Vigo died shortly after completing it and the studio re-edited it. Temple explores how Vigo took a simple premise and transformed it into a classic of French cinema. He points out that the most of it was shot on location during the early days of sound, which was very difficult to pull off, especially with Vigo in ill health. The second disc starts off with 40 second animated “Tribute by Michel Gondry” who celebrates Vigo’s film in his own, distinctly idiosyncratic way. “Cineastes de Notre Temps” is a 98-minute documentary on the career of Vigo that aired on French television. Several people who worked with him on his films give their impressions of the man and tell filming anecdotes. This profile does a good job conveying why Vigo is so highly regarded in France. “Truffaut and Rohmer on L’Atalante” features the two French New Wave directors talking about Vigo’s film. The former recounts when he first saw Vigo’s films and the profound effect they had on him. “Les Voyages de L’Atalante” examines the evolution of the film over the years, from its initial butchered version to a more complete one assembled and released in 1990. Included are fascinating rushes from filming that shed some light on Vigo’s working methods. Finally, there is “Otar Iosseliani on Vigo” with the Georgian-French filmmaker talking about how Vigo influenced his films.